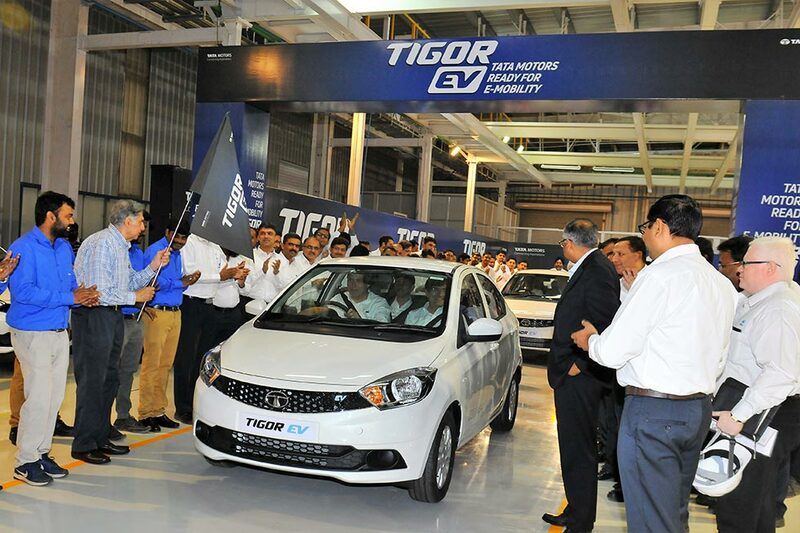 Tata Motors today rolled out the first batch of the Tigor Electric Vehicle (EV) at the hands of N Chandrasekaran, Chairman, Tata Sons and Tata Motors, from its Sanand facility in Gujarat. Present on this momentous occasion were Ratan N Tata, Chairman Emeritus, Tata Group, Guenter Butschek, CEO & MD, Tata Motors and members of the Tata Motors Executive Committee. 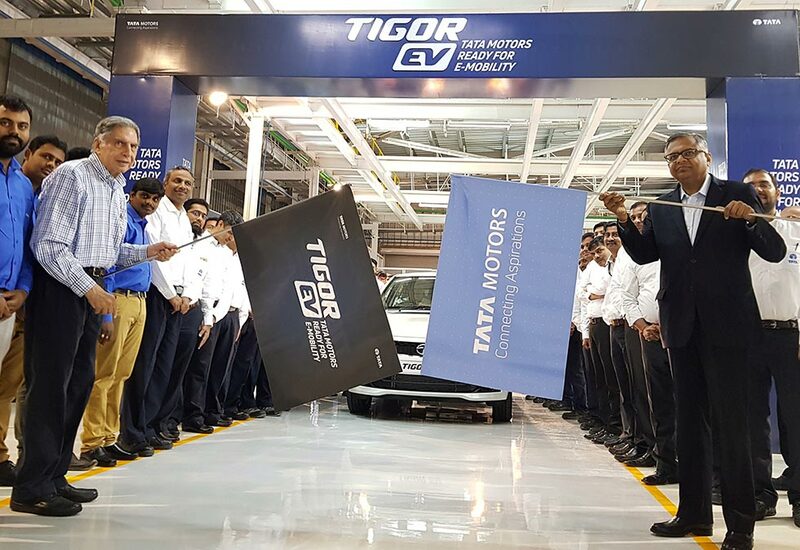 The Tigor EVs are being manufactured for the Indian Government’s prestigious order of electric vehicles from the Energy Efficiency Services Ltd (EESL), an entity under the Ministry of Power. 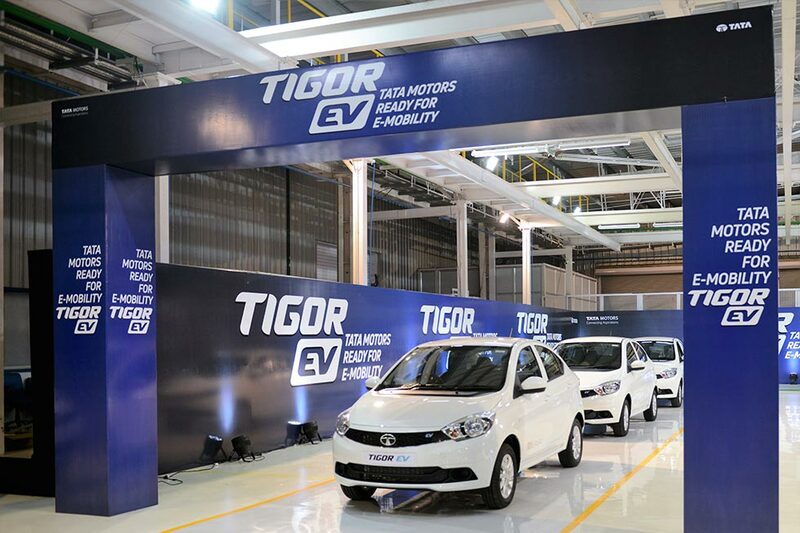 Tata Motors today rolled out the first batch of the TIGOR Electric Vehicle (EV) manufactured for the Energy Efficiency Services Ltd (EESL) order. In the image, Mr. Ratan N Tata, Chairman Emeritus, Tata Group and Mr. N Chandrasekaran, Chairman, Tata Sons and Tata Motors flagging off the first batch of TIGOR EVs from the Sanand plant. Roll out of the first batch of TIGOR Electric Vehicle (EV) at the Sanand plant, marking a significant milestone in the Tata Motors’ readiness to build the future of e-mobility. Tata Motors had qualified as L1 bidder in the midst of stiff competition and won the tender of 10,000 electric cars floated by EESL in September 2017. For phase 1, Tata Motors is required to deliver 250 Tigor EVs, for which it has received a LoA. For an additional 100 cars, the LoA is expected to be issued shortly by EESL. The electric drive systems for this prestigious order have been developed and supplied by Electra EV – a company established to develop and supply electric drive systems for the automotive sector. Tata Motors is committed to the Government’s vision for electric vehicles by 2030 and will work in a collaborative manner to facilitate faster adoption of electric vehicles and to build a sustainable future for India.